Wildcat Mountain AKA Wildcat "A" Peak is the northernmost peak on the Wildcat Ridge and it's five peaks A through E, with D Peak being the other "official" 4,000 foot peak. Wildcat summit is located on the Wildcat Ridge Trail (AT) and is a wooded summit that has an outlook nearby the looms high above Carter Notch with views across to Carter Dome and the Carter mountain range. The quickest way to get to Wildcat A Peak is from the Nineteen-Mile Brook Trail to Wildcat Ridge Trail. -Wildcat Ridge Trail: From Pinkham Notch Visitor Center 5.2 miles, 3,250 feet via Lost Pond Trail. From Nineteen-Mile Brook Trailhead 4.2 miles, 3,000 feet. 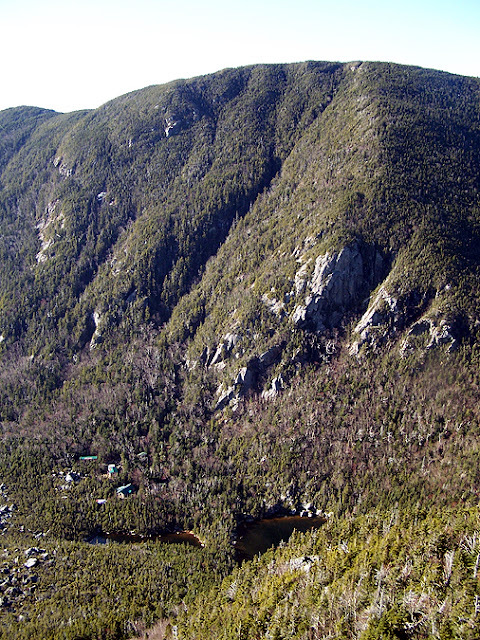 The hike to A Peak from Nineteen-mile Brook Trail has easy to moderate grades with good footing until you reach the Wildcat Ridge trail where the terrain becomes very steep with a rough and rugged trail for the last .7 miles and elevation gain of 1,050 feet. The hike to Wildcat A Peak along the Wildcat Ridge over all peaks is very steep from the trailhead to Wildcat E Peak with some pretty open ledge scrambles that can be difficult to novice hikers and dangerous when wet. The hike along the ridge is very rough with many ups and downs along the way that can be tiring. However the views from the open ledges of Mount Washington and Pinkham Notch are spectacular!